On Avaya Session Border Controller for Enterprise (SBCE), where do you access the tool that displays SIP messages, in real time, as they pass through the SBCE? 1. Launch PuTTY (or similar client application) for a SSH session to Session Manager (port 22). Use the Session Manager IP Address (172.16.255.107). 3. At the Session Manager command line type traceSM -x and press Enter. Note: The traceSM tool shows the SIP call flow in Session Manager. It gives insight into Session Manager's decisions. For an Avaya SIP telephone, working as a Remote Worker via the Avaya Session Border Controller for Enterprise (SBCE), which IP address should be configured in the Server List of the one-X® Communicator? D. the Avaya Aura® Session Manager External Interface allocated for Mobile Workspace Endpoints. B: Application relays function as port forwards. Different clients require different application relays. A: An Avaya SIP phone downloads and processes a configuration file, sends out a slew of SUBSCRIBE messages, and uses something called Personal Profile Manager (PPM). Note: The PPM is a software module that runs as part of an Avaya Session Manager. It consists of a series of web services that phones use to retrieve and manage SIP related user data. On Avaya Session Border Controller for Enterprise (SBCE), which statement about how to examine messages with Wireshark is true? A. You have to start and stop the .pcap file using command line. B. You can start and stop a Packet Capture in the EMS web GUI and then you can open the .pcap file with Wireshark. C. Wireshark runs directly on Avaya Session Border Controller for Enterprise (SBCE). D. They cannot be examined on this version. Viewing the Packet Capture with Wireshark. 0. Start a Packet Capture in the EMS web GUi. 1. After the capture completes, click the Capture tab. 2. Double-click on the capture file name. 3. The File Download window opens. The Wireshark application opens the trace. Note: The Wireshark call tracing tool can be used on virtual desktop for vLabs. 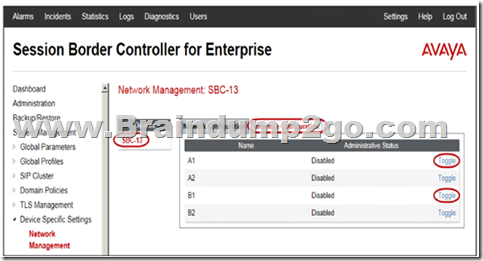 After running the Install wizard on Avaya Session Border Controller for Enterprise (SBCE), you added a Public Outside IP address to the B1 interface. You try to ping this IP address from a PC in the same subnet but it falls. What would you do first to resolve the issue? B. Set the Default Gateway router IP address, navigate to the Interfaces and Enable the B1 Interface. D. Navigate to Device Specific Settings > Network Management > Interfaces and Enable the B1 interface. The interface might need to be enabled. 1. The A1 and B1 interfaces display on the Network Configuration tab. 2. Click on the Interface Configuration tab. The AXC connector is always co-resident with the Avaya message store. In Avaya Aura® System Manager, how is Avaya Aura® Messaging (AAM) added to the list of Managed Elements? A. It is added when you configure the AAM SIP Entity in SMGR. B. It is automatically added during the enrollment process. C. It can only be manually added. 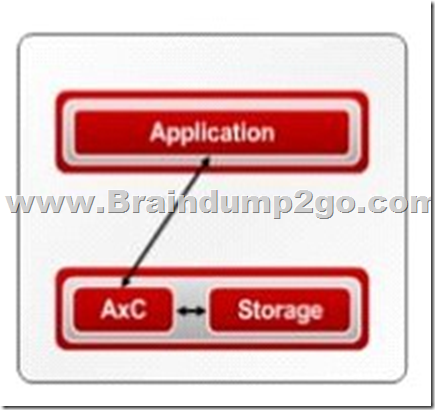 D. It is automatically added using initTM -f command on the Command Line Interface of AAM. In Avaya Aura® Messaging (AAM) 6.3, how many Call Answering Ports can one Application Server support? The Call Answer Ports range is 2-100. An Avaya Aura® Messaging (AAM) server intended to store Voice Messages in Avaya Message Store Mode, and you are configuring that server for integration with an Avaya Aura® Core. In Messaging Administration > Server Settings > Server Role/AxC Address, which Server Role must be chosen at the "Roles for this server" field? * Server Information: Voice Channels (Application), and Cache Statistics (Application) Etc.